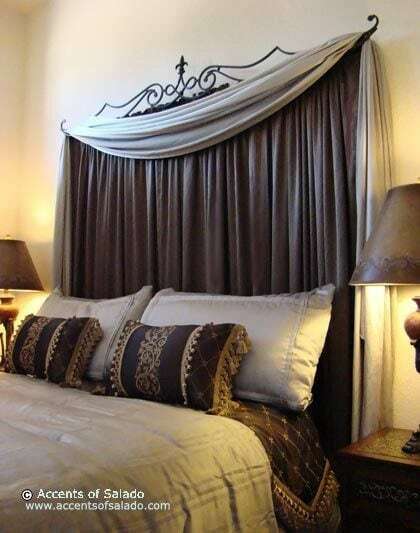 A good headboard can make a bedroom seem more comfortable and relaxing. On the other hand, a bad headboard can make you want to stay up for days on end. Such is the importance of headboards. 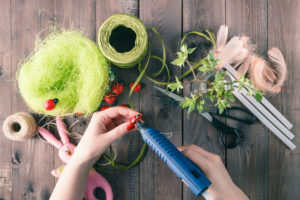 Lick your finger and flip through any home store catalog and you’ll find plenty of fabric headboards, but they might also cost you an arm, a leg and perhaps a digit on the arm. 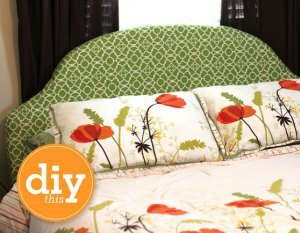 Instead, consider making your own DIY fabric headboard – save time, have fun and make something customized and personal. 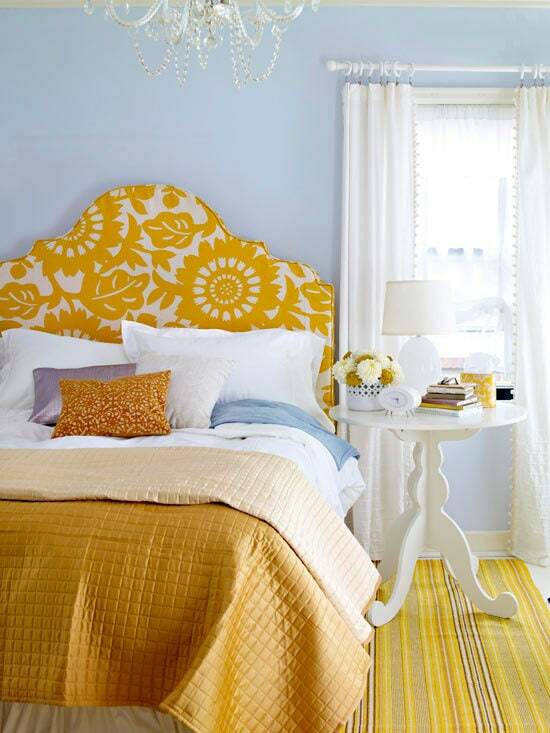 Here are 22 (plus our own) headboard ideas you can use to make your own beautiful DIY headboard. This one’s nice because of how thick it is. 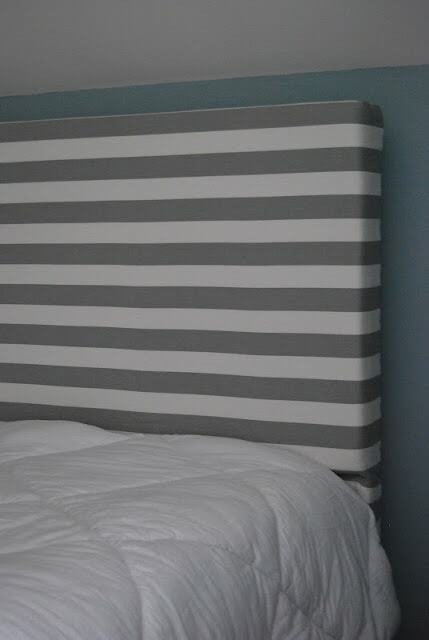 A lot of the DIY headboard we came across are thinner, so we liked that this one stood out and seemed sturdy. 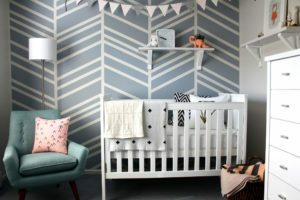 We also love the horizontal stripes – it creates a clean look that makes us want to lay down and dream. We’re a big fan of the button-tuft look, and this one is great because of how simple it is. With a lot of buttons, you’ll get a lot of tufts, which looks good in its own style. But we like how this one has understated, simple buttons. It keeps the focus on the headboard shape and style itself rather than the buttons. 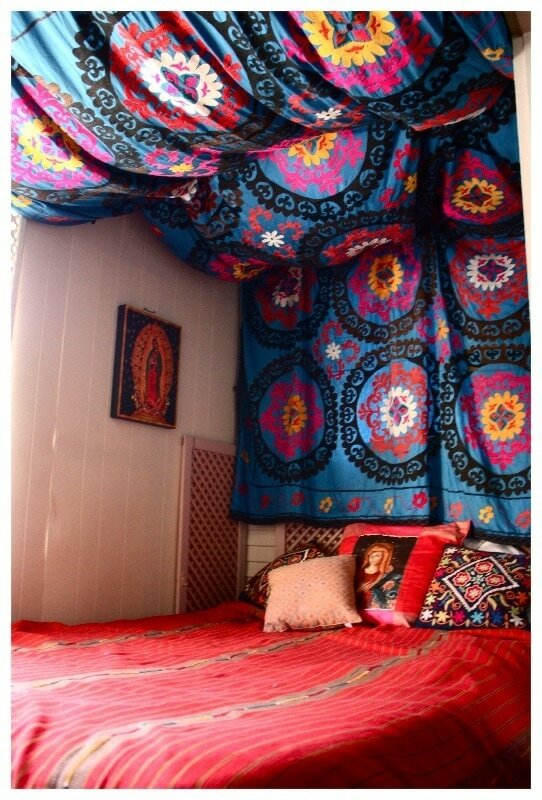 This is a cool idea that’s easy to match up to the rest of your room because you can use similar (or the same) curtains or fabric. It also gives the bed the appearance of being backed up to a window, which seems neat. In some states they say “go big or go home.” That must be where this bad boy came from. We are people of relatively average height and so this is a little too wide for us, but we love the ambition and the design. These panels are neat because they remind us of wall art, and so they serve a few different purposes. They play the role of headboard, but they also look more decorative than most headboards. The stencils themselves are available from cutting edge stencils (link below picture). 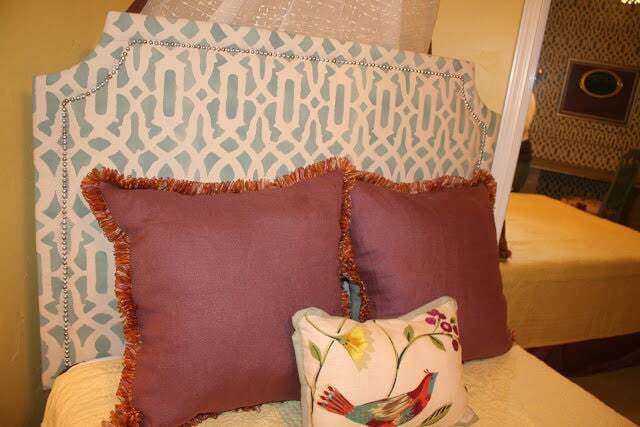 Another stenciled fabric that we love. The color scheme here is also gorgeous, and the whole thing looks so inviting that in our heads we are already laying down with a book. Maybe something light and easy, because we know we’re going to fall asleep within minutes of laying down. It’s just that sort of bed. Unlike the headboard with only a few buttons, this one looks good because of how many buttons and tufts it has. 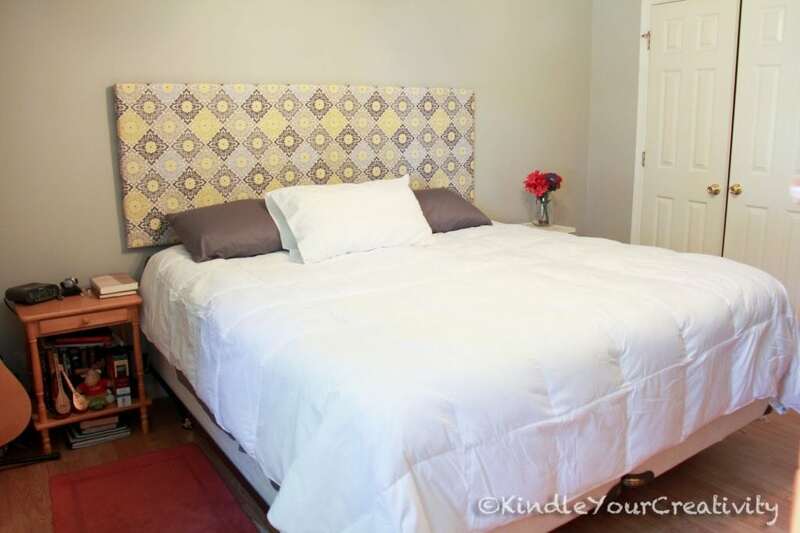 They’re all lined up nice and neat, and the look makes this DIY headboard seem a lot more expensive and high-end than the cost of goods to make it. Another great button design, but this one has very light tufts and creases in the fabric, which is a good way to keep this style but make it more subtle. It’s also tall and creates a great presence in the room (we imagine). Sometimes less is more, and in this case, it comes together perfectly. The shape of this headboard is curved slightly, giving the wall a different look when compared to the straight-across headboards. 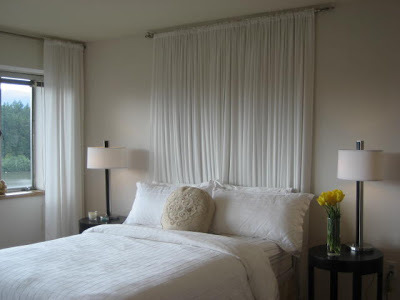 The fabric is textured, but light-colored, which makes the whole thing seem open and airy. Loves it. 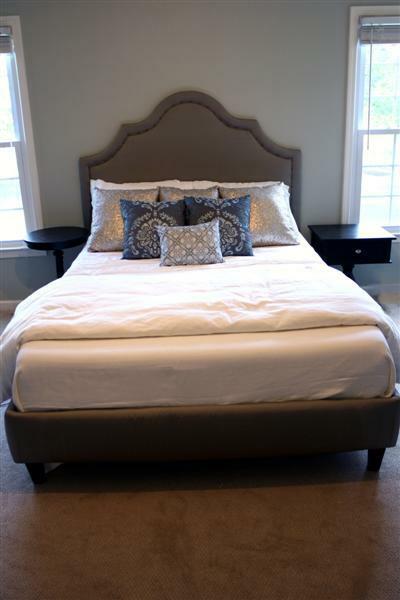 Another headboard with decorative trim, this bod piece is a great way to bring life and color into your bedroom. The brightness of the nails sticks out and the white-blue design is comforting. 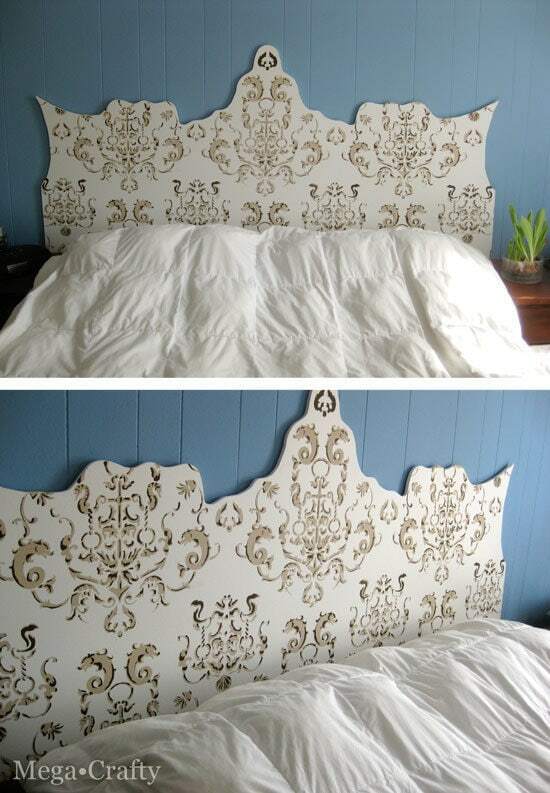 This headboard would be suitable for royalty. But you can have it, too. 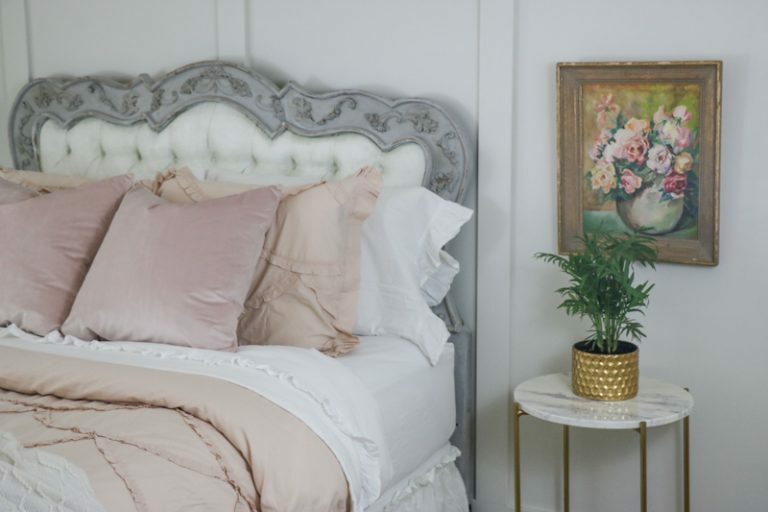 We love the white-washed look, and when you check out the details of how they made this headboard with the link below, you’ll be amazed at how good of a job they did in putting everything together. Looks gorgeous! Again, sometimes less is more. 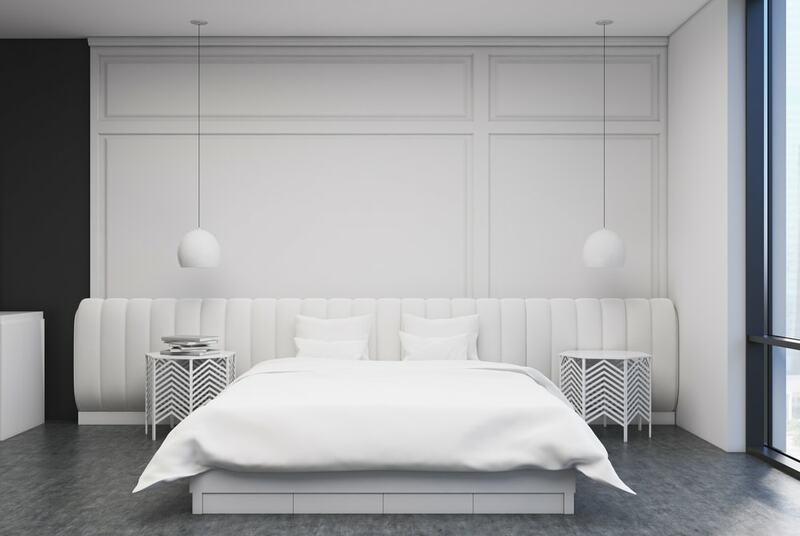 If that’s your style, a simple gray or another neutral color will be a great way to anchor your bed in place without taking over the room. It keeps the whole setup looking balanced. We’ve covered tufts and buttons, but we love how well this one looks. And it’s up close. At this level of detail, you can really see the difference between good, quality buttons, and tufts that took time to make, and sloppy ones. If you’re going to do it, do it right and make it look like this little rascal. There’s nothing subtle about this headboard, and yet that is its charm. We love the shape and the bold fabric choice and combined with the chandelier above and the rest of the colorful room, it all comes together nicely. This wins unique points for being something we’ve never seen or thought of before. This would be great for the younger folks who want to do something that they will remember for the rest of their lives, or at least until they grow up and enter the normal routines of adulthood. We love how much depth this headboard brings to the table. At any moment you expect the curtains to spread and a movie to start playing on the wall. If you had a projector, you could do that. 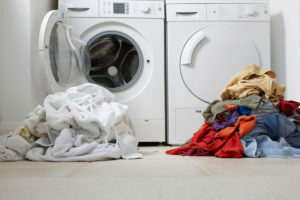 Otherwise, this is a great idea and offers a lot of options in the way of fabric, colors and so on. 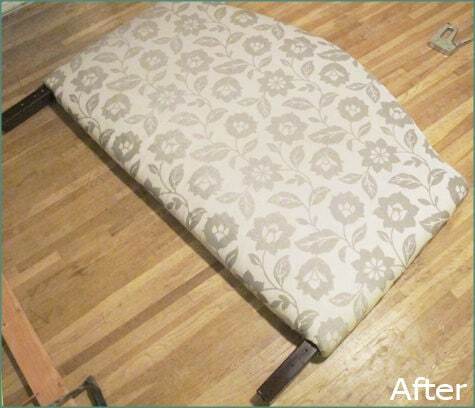 This little number gives you a raw look at what a DIY fabric headboard looks like before it’s put in place. 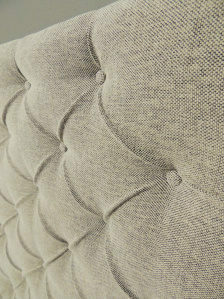 Follow the link below the picture to get a better idea of how this cute headboard was put together. 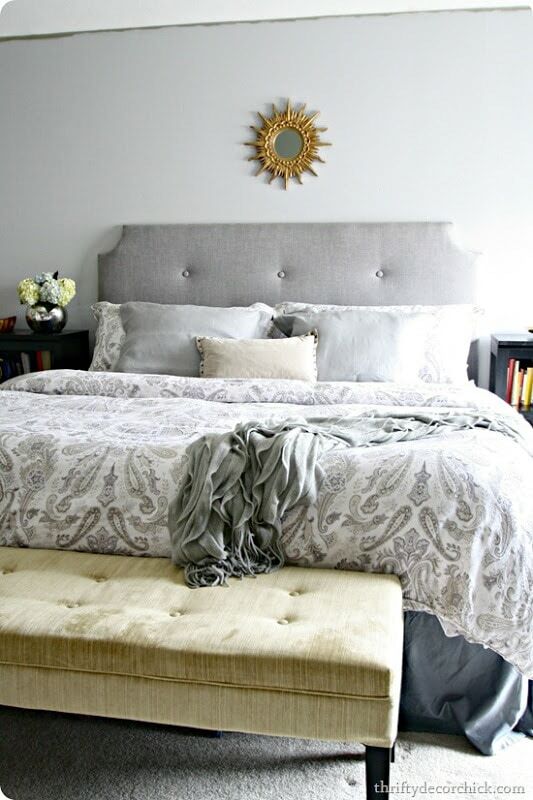 We love this headboard because white is a ballsy choice. But here it pays off. 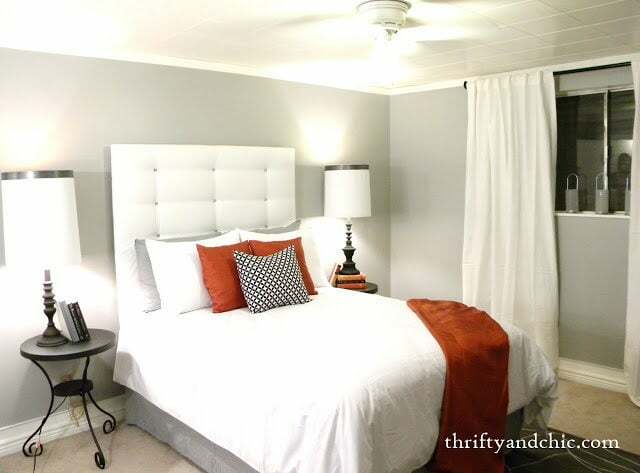 The white and grey background are the perfect backdrop to the reddish accents of the pillow and blanket. If you don’t have kids, this would be a great option. If you do have kids, you might still be able to pull it off. We don’t know. 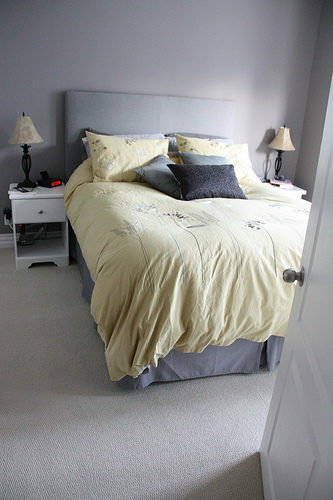 While the first example we showed was thick, this one goes to show that you can make a thin headboard work just as well. The detail and pattern of the fabric here add an extra layer of depth so even though the headboard itself isn’t that thick, it doesn’t look flat and lifeless. They say you should save the best for last, but we’re not here to pass judgments. 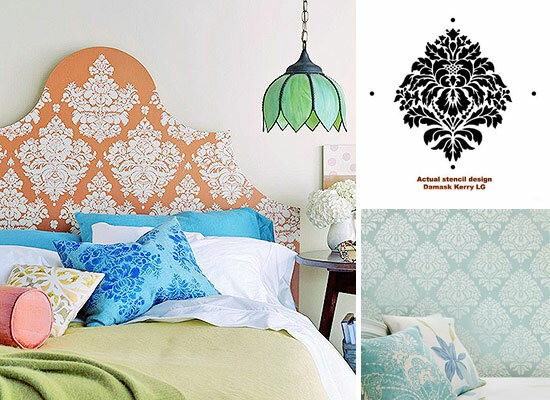 This green headboard is great because of the intricate pattern. It matches well with the pillows, which don’t have as much going on. Something about this bed looks wild and we want to know what it is. Firsthand. Which headboards could you see fitting your bed and bedroom style?